This past weekend was perfect for gardening. The sun was hot, the pool was cool, and I had just created four new beds in need of mulch. As I was tossing mulch, I contemplated my garden - especially the ever-present question of annual versus perennial flowers. For those who don’t know, there is a major difference between annual and perennials. Annuals are flowers that die after the end of each season. Perennials are flowers that come back year after year. “Why would anyone ever buy an annual?”, you might ask. Well, let me explain. Annuals tend to flower with color all summer long. They are cheaper and deliver a brilliant, immediate spectacle. The only downside is they require effort and expense each year as you buy new ones and plant them over and over again. Perennials, on the other hand, cost more initially. They also flower less brilliantly and over shorter periods of the summer. They therefore require significantly more up-front effort and cash expenditure to create a colorful, summer-long garden. Unless you are willing to spend the time and thought necessary and to wait for a few years for the initial plants to grow large enough for splitting and spreading, a perennial garden will require significantly more money to create a masterpiece. It is due to this tradeoff that most of my gardening friends have a strong preference for annuals. The allure of the immediately beautiful garden draws them right in. 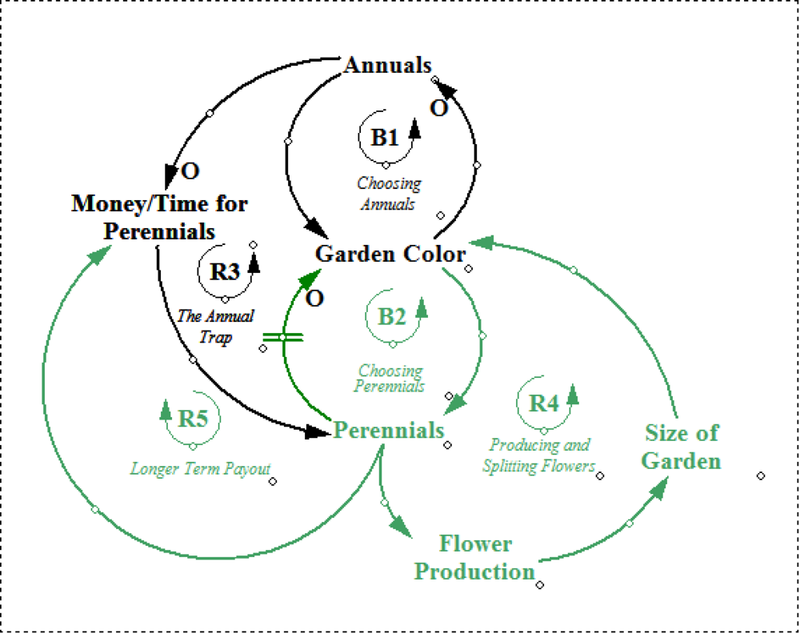 They get trapped in the everlasting cycle of buying and planting annuals with no time or money left for the perennial. They don’t realize the joy of perennial flowers popping up in the spring with absolutely no work on the part of the gardener. They saw my puny garden in the first few years of home ownership and were not inspired. It was not until now, almost four years later that passersby can see the results. My puny perennials are now huge, and I have distributed them throughout the yard. And they pop up to surprise me constantly in an ever-shifting display of color. My work from the early days is paying off and most of the original beds now need very little work. The neighbors now go on and on about how beautiful my garden is. And it is all due to the power of perennials. All this praise as I spend my time relaxing (or blogging) or on creating entirely new beds from the ever expanding plants born of earlier labor. The gardener’s choice between annuals and perennials is similar to the choices we make everyday in many other arenas. Do we choose the fast and easy solution or do we spend the extra up front time and money for a solution that is more sustainable? Do we invest in preventive care and effort for our personal health or do we treat illness symptoms? Do we invest in preventive care in our healthcare systems or do we spend our energy treating the chronically ill? Do we invest in developing relationships with key international leaders, or do we allow situations to deteriorate until bombing seems like the right choice? Do we build shelters for homeless, or do we invent in finding permanent homes? Do we do what it takes to eradicate polio, or do we wait until it rears it head again and respond as needed? Fast solutions often lead to constant toil and spending, while more enduring and sustainable solutions usually require huge upfront investment, but will allow us to sit back and enjoy the fruits of our labor in the future years. The latter is what we can achieve through Systems Thinking – a long-term, holistic look at the choices we face. How does your garden grow? Fixes that Fail: Why Faster is Slower?